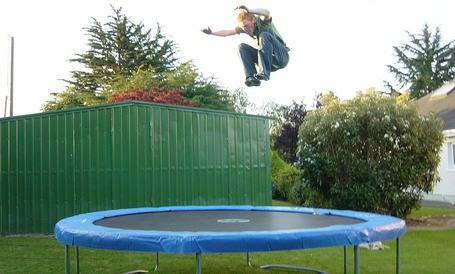 Trampolines have become increasingly popular over the last ten years or so. They've actually been around for nearly 100 years, so it may be surprising to know that trampolines have a bit of a sorted history. There are a lot of cool things to know about trampolines, including how they got to where they are today. What Materials are Trampolines Made of? How is a Trampoline Made? When do Trampolines Go on Sale? Where was the Trampoline Invented? Why was the Trampoline Invented? When was the Trampoline Invented? How was the Trampoline Used When it was Invented? When did the Trampoline Become Popular? When was the Trampoline Added to the Olympics? Here are 11 cool things you may not have known about trampolines. Most of the metal pieces, such as the frame and springs, will be made of some variation of galvanized steel. Your jumping surface is most likely a woven mixture of nylon and other synthetic materials such as polyethylene, specially designed to give you that "springy feeling" most trampolines give you when you walk across the surface, while your safety pads are typically made out of impact absorbing foam, similar to what you might find inside of a bicycle helmet (although, probably much softer). What Metal is a Trampoline Made of? As we already mentioned, all trampoline metal pieces are made of some variation of galvanizes steel. This is actually pretty cool to watch. If you ever get the chance to watch this in person online, check it out! 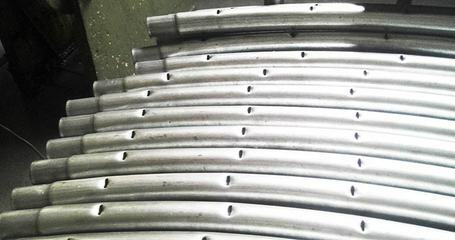 Metal tubing is first bent into the desired shape to form the frame of the trampoline. Holes are punched into the frame and sockets are welded on where they need to be, making it possible for you to attach the pieces together using screws and bolts. Once the fabric for the jumping surface is woven, it's cut into the appropriate shape and size and seemed around the edges. D-rings are attached to the outer edges of the jumping surface, allowing you to connect it to the frame using springs. Viola! Ok, I'm oversimplifying this process a little bit, but that should give you a basic idea of what goes into making a trampoline. In most cases, they're going to go on sale when they're not in season. Look for the best deals and clearance prices when the summer weather begins to cool off and give way to fall weather. Black Friday can also be a great chance to snag a trampoline at a good price if you're willing to fight through the crowds. Beyond that, there are always great deals online at places like Amazon. 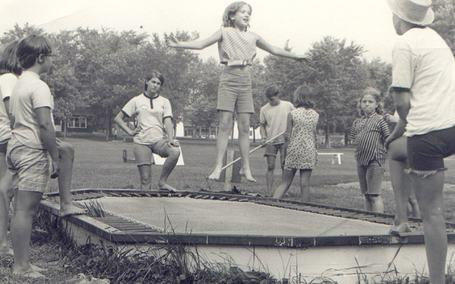 The first trampoline designed for public use was made around 1950. There's a pretty interesting story behind this, so stay tuned! The original idea for the trampoline was conceived by a young man named George Nissen. He first had this idea while he was living in the Long Island area. His invention made its first public appearance in New York City's Central Park. 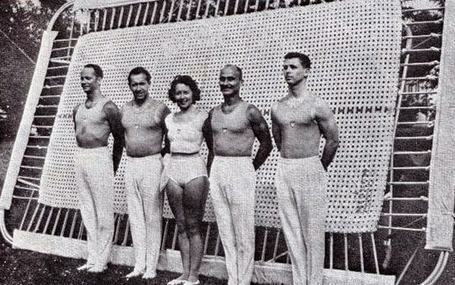 Nissen was a young gymnast looking for a way to improve his training regime. He originally used some old steel and inner tubes from old tires he found in a scrap yard. He originally called his invention the "bouncing rig." George Nissen's original idea came to him in the 1930's. It took him some time to get people on board, but within a few years, the trampoline was destined to become a national craze. 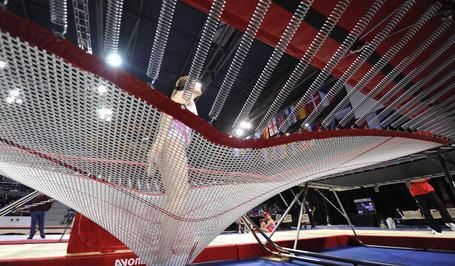 Originally, it was used as a way to help Nissen train in gymnastics. His wife, who as also a gymnast, soon came to love it as well and, over time, it became a popular attraction at state fairs and even gas stations. By the 1950's, virtually every gas station in America had a "jump center," where kids were allowed to jump on a trampoline and burn energy while parents busied themselves with shopping and filling up the car. This popularity didn't last long though. Early trampolines were notoriously dangerous and, by 1980, so many severe trampoline injuries had become so common, Nissen found himself facing countless lawsuits and the public began to quickly abandon this form of recreation. It took a surprisingly long time for the trampoline to first appear in the Olympics. 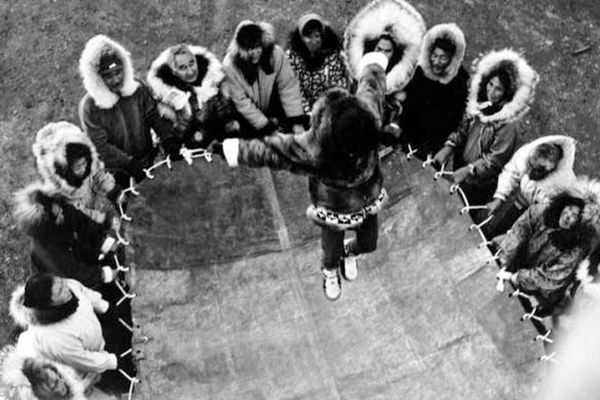 This didn't happen until nearly 70 years after the trampoline was invented, in the 200 Winter Olympics. While trampolines used to be considered extremely dangerous, they've actually come a long way recently. 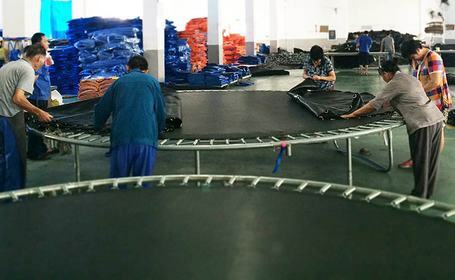 Safety features that weren't even dreamed of when the trampoline was first invented are now a standard in the manufacturing process. It may be impossible to eliminate the risk of injury altogether, but trampolines are safer than ever these days and every bit as fun as they ever were.